Opportunities can be created by using button at the top right corner of the Opportunity list page. You can also click button from the center of the top navigation bar and click Opportunities to create an Opportunity. When you create an Opportunity, you identify the Opportunity type as either Buyer or Seller. You can also enter the Property details associated with this Opportunity. 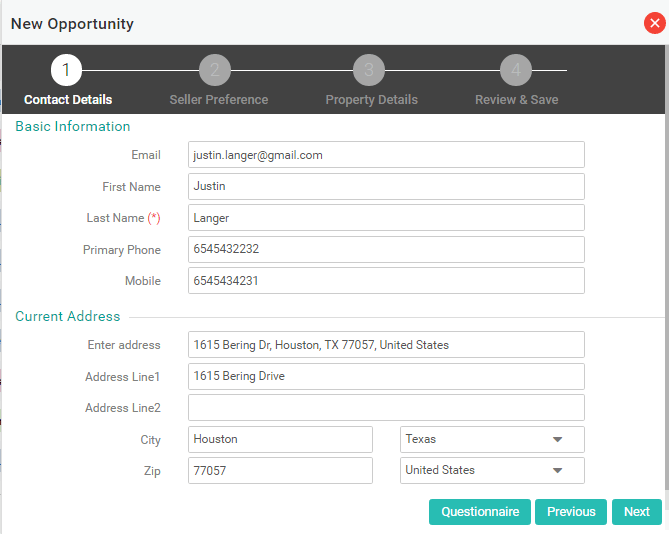 While ZipperAgent helps in bringing in as much information as possible related to the Contact and the associated Property for the Opportunity from publicly available data, you can capture detailed Contact Information, Buyer Preference, Financial Details and Referrals related to the Buyer Opportunity by navigating to the Opportunity detail and using the option. You can link one or more Properties with a Buyer Opportunity and manage all Activities including Showings for the Opportunity. 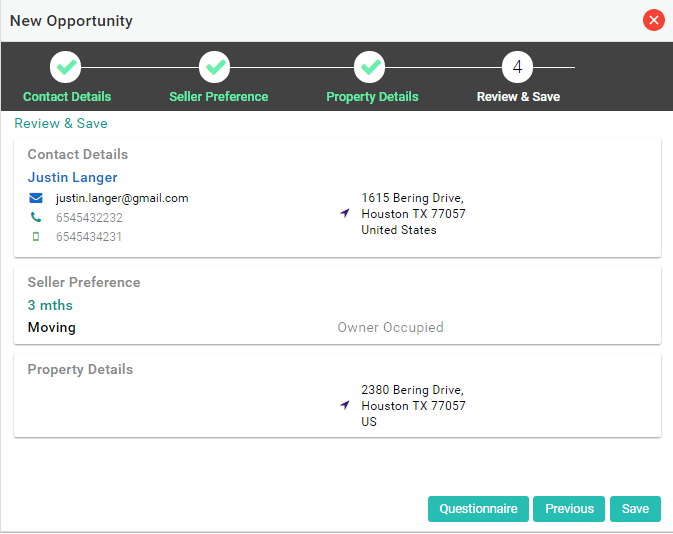 Similar to Buyer Opportunity, you can capture detailed Contact Information, Property Details, Seller Preference, and Lockbox information related to the Seller Opportunity by navigating to the Opportunity detail and using the option. You can link one of more prospective Buyers with a Selling Opportunity and manage all Activities including Showings and Offers for the Opportunity. 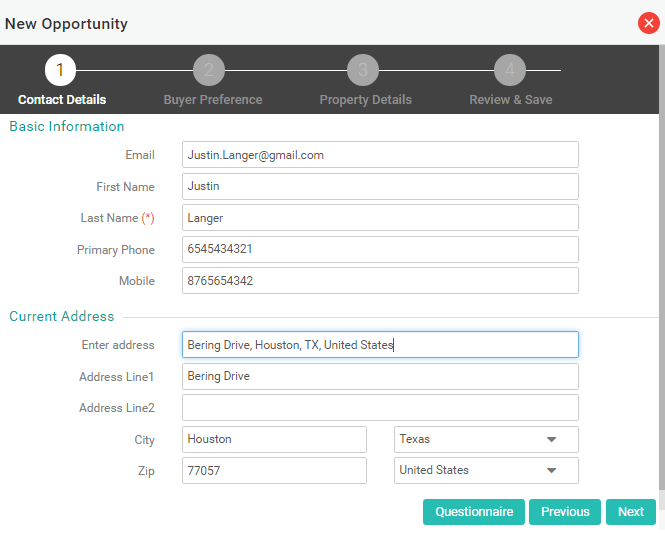 Closing Details of both types of Opportunities can also be captured from the Opportunity Detail page. ZipperAgent also helps you to link emails to track correspondence and documents to maintain a complete history of the deal. 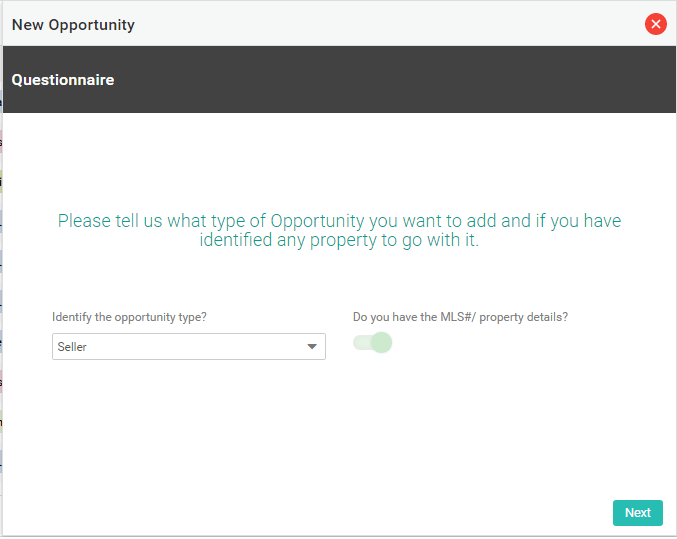 Identify the Opportunity type as Buyer, let ZipperAgent know whether you have the property details and then click on next. Enter the Contact Details, which include Email, First Name, Last Name, Primary Phone and Mobile. As you start typing in the Enter Address text box, ZipperAgent will help you to auto-complete all the related fields of Current Address. You can modify the related fields of Current Address based on your requirements. There are two ways you can associate a Property with a Buyer Opportunity. 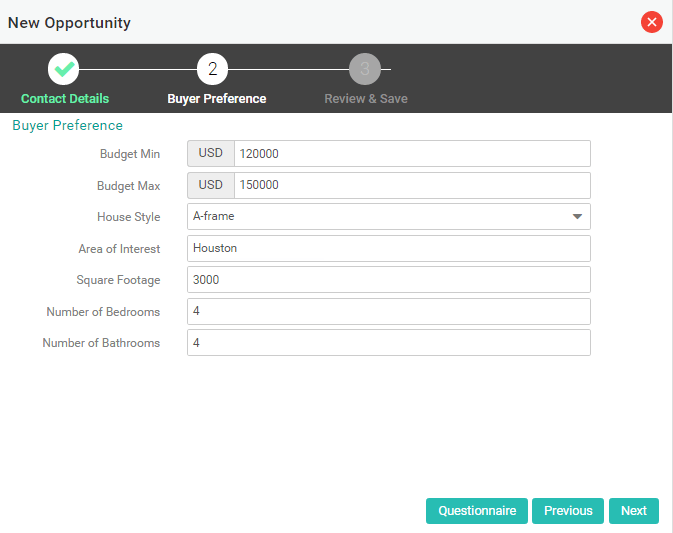 You can either do it while you create the Buyer Opportunity or else you can navigate to the detail page of the Buyer Opportunity, click on and then associate a Property from the related Property list page. The Add Property lookup allows you to search and associate an existing Property. ZipperAgent also gives you the ability to add a new Property from the Add Property lookup page by clicking on New Button. 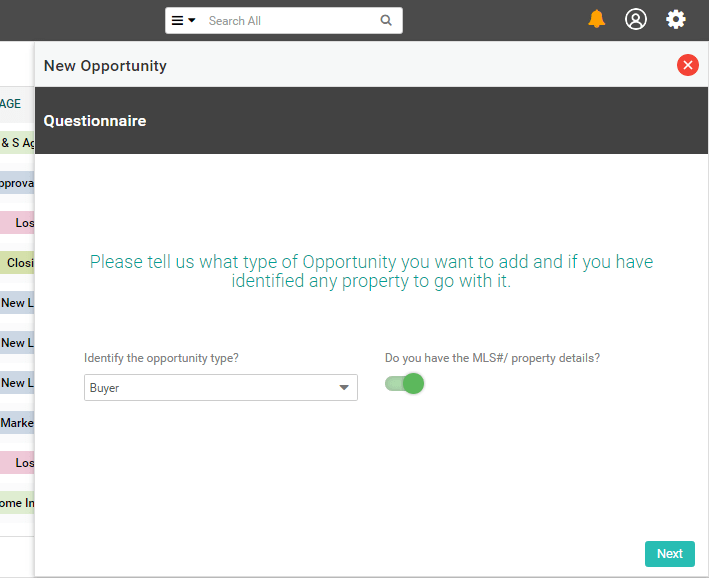 Once you have selected a Property or added a New Property from the Property lookup page, you have the ability to associate it with the Buyer Opportunity directly by clicking on Add button. While associating the Property you can also update the Showing Status, Show Date and Interest Level of the buyer with this Property. 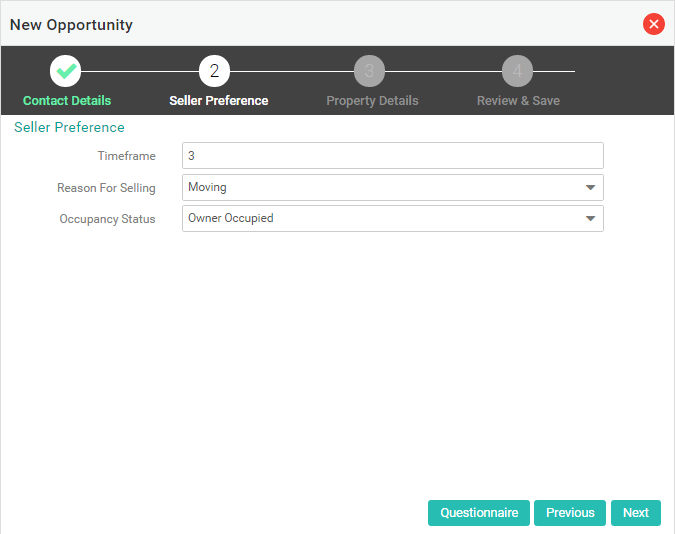 Identify the Opportunity type as Seller and click on Next. Enter Seller Preference, which includes Timeframe in months by which the seller wants to sell the Property, Reason for selling and Current Occupancy status. ZipperAgent pre-populates the fields in this sub-page with default values. You can change the values based on your requirement. Review the information added in the previous sub-pages. If any corrections are required navigate to the previous sub-pages using the navigation aids at the bottom of the sub-page. Save the information if all the data entered looks correct. 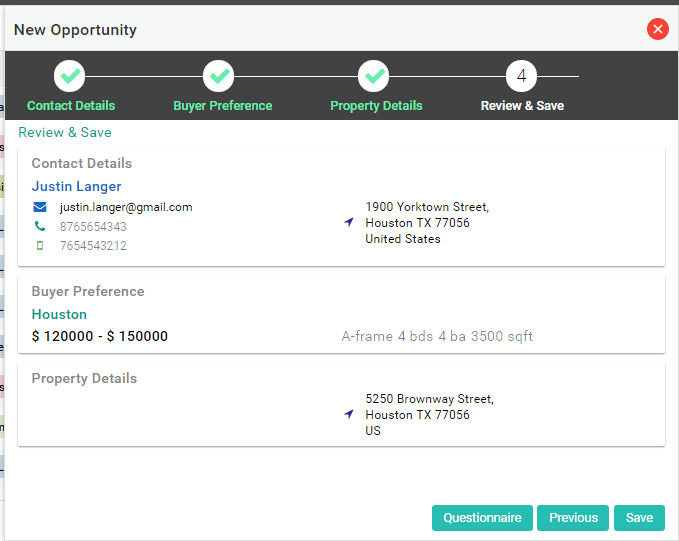 To associate a potential Buyer with a Seller Opportunity in ZipperAgent, you need to navigate to the detail page of the Seller Opportunity and click on more and then associate a Buyer from the related Buyer list page. The Add Buyer lookup allows you to search and associate an existing Contact. ZipperAgent also gives you the ability to add a new Contact from the Add Buyer lookup page by clicking on New. Once you have added a New Contact from the Contact lookup page, you have the ability to associate it with the Seller Opportunity directly by clicking on Add. While associating the selected Buyer or the newly added Buyer you can also update the Showing Status, Show Date and Interest Level of the Buyer with this property. While working with a Buyer Opportunity, on several occasions you need to quickly take some actions or record some information related to a potential Property. 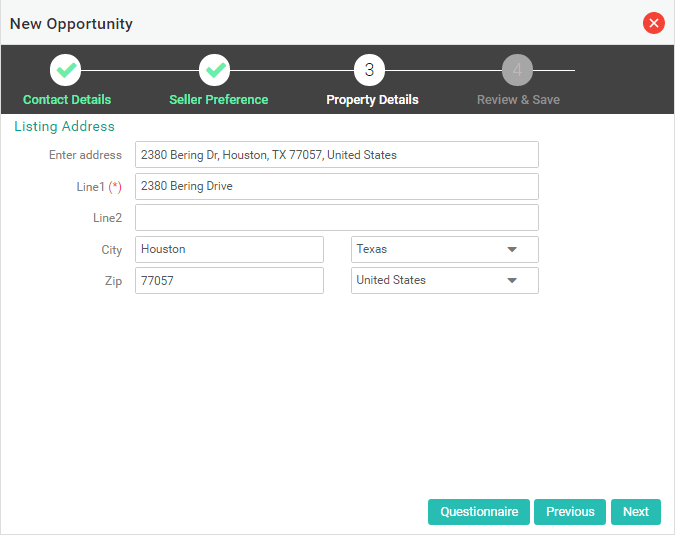 In ZipperAgent you can do so from the associated Property list page of that Opportunity without navigating to the detail page of the Property. You can see all the available Smart Actions by clicking on the Action button. Apart from scheduling Calls, Meetings, Tasks, Emails and uploading Documents, you can also update the status and date of Showings using the Smart Actions. You can record the interest level of the Buyer for a Property from the Property list page itself by clicking on rating icon. Similar to working with Buyer Opportunities, while working with Seller Opportunity, on several occasions you need to quickly take some actions or record some information related to a potential Buyer. In ZipperAgent you can do so from the associated Buyer list page of that Opportunity without navigating to the detail page of the Buyer. You can see all the available Smart Actions by clicking on the action button. Apart from scheduling Calls, Meetings, Tasks, Emails and uploading Documents, you can also update the status and date of Showings using the Smart Actions. You can record the interest level of the Buyer for the Property from the Buyer list page itself by clicking on rating.